Lately it has become a matter of conventional wisdom that hydrogen will solve many of our energy and environmental problems. Nearly everyone -- environmentalists, mainstream media commentators, industry analysts, General Motors, and even President Bush -- seems to expect emission-free hydrogen fuel cells to ride to the rescue in a matter of years, or at most a decade or two. Not so fast, says Joseph Romm. In The Hype about Hydrogen, he explains why hydrogen isn't the quick technological fix it's cracked up to be, and why cheering for fuel cells to sweep the market is not a viable strategy for combating climate change. Buildings and factories powered by fuel cells may indeed become common after 2010, Joseph Romm argues, but when it comes to transportation, the biggest source of greenhouse-gas emissions, hydrogen is unlikely to have a significant impact before 2050. The Hype about Hydrogen offers a hype-free explanation of hydrogen and fuel cell technologies, takes a hard look at the practical difficulties of transitioning to a hydrogen economy, and reveals why, given increasingly strong evidence of the gravity of climate change, neither government policy nor business investment should be based on the belief that hydrogen cars will have meaningful commercial success in the near or medium term. 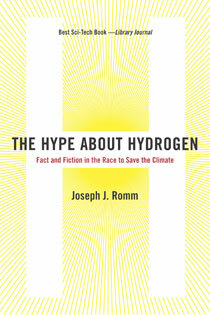 Romm, who helped run the federal government's program on hydrogen and fuel cells during the Clinton administration, provides a provocative primer on the politics, business, and technology of hydrogen and climate protection. "Vital, very readable guidance for investors, environmentalists, and interested bystanders looking toward a future without fossil fuels." "It's hard to argue with the relentless logic...."
"Readers looking to separate facts from hype about cars running on hydrogen and large-scale fuel cell systems will find a useful primer here." "…this book serves as a primer on what to expect as the cost of energy becomes increasingly expensive. It is a must-read for environmentalists who may be expecting too much from hydrogen fuels and for business executives who may be promising too much in terms of next-generation energy technologies." "Producing hydrogen for vehicular use from fossil fuels creates just as much pollution as burning gasoline does. For details on why this is so, read The Hype About Hydrogen by Joseph Romm, an energy department official who oversaw hydrogen and fuel-cell research during the Clinton administration." Chapter 1. Why Hydrogen? Why Now?